The correct command updates the state and state estimation error covariance of an extendedKalmanFilter, unscentedKalmanFilter or particleFilter object using measured system outputs. To implement extended or unscented Kalman filter, or particle filter, use the correct and predict commands together. If the current output measurement exists, you can use correct and predict. If the measurement is missing, you can only use predict. For information about the order in which to use the commands, see Using predict and correct Commands. [CorrectedState,CorrectedStateCovariance] = correct(obj,y) corrects the state estimate and state estimation error covariance of an extended or unscented Kalman filter, or particle filter object obj using the measured output y. You create obj using the extendedKalmanFilter, unscentedKalmanFilter or particleFilter commands. You specify the state transition function and measurement function of your nonlinear system in obj. You also specify whether the process and measurement noise terms are additive or nonadditive in these functions. The State property of the object stores the latest estimated state value. Assume that at time step k, obj.State is x^[k|k−1]. This value is the state estimate for time k, estimated using measured outputs until time k-1. When you use the correct command with measured system output y[k], the software returns the corrected state estimate x^[k|k] in the CorrectedState output. Where x^[k|k] is the state estimate at time k, estimated using measured outputs until time k. The command returns the state estimation error covariance of x^[k|k] in the CorrectedStateCovariance output. The software also updates the State and StateCovariance properties of obj with these corrected values. y(k) = h(x(k)) — for additive measurement noise. y(k) = h(x(k),v(k)) — for nonadditive measurement noise. Where y(k), x(k), and v(k) are the measured output, states, and measurement noise of the system at time step k. The only inputs to h are the states and measurement noise. [CorrectedState,CorrectedStateCovariance] = correct(obj,y,Um1,...,Umn) specifies additional input arguments, if the measurement function of the system requires these inputs. You can specify multiple arguments. y(k) = h(x(k),Um1,...,Umn) — for additive measurement noise. y(k) = h(x(k),v(k),Um1,...,Umn) — for nonadditive measurement noise. correct command passes these inputs to the measurement function to calculate the estimated outputs. Estimate the states of a van der Pol oscillator using an extended Kalman filter algorithm and measured output data. The oscillator has two states and one output. 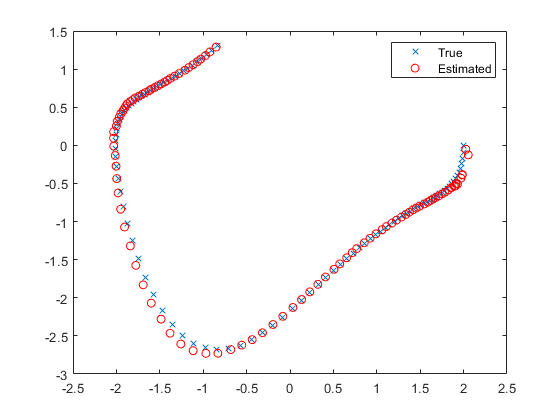 Create an extended Kalman filter object for the oscillator. Use previously written and saved state transition and measurement functions, vdpStateFcn.m and vdpMeasurementFcn.m. These functions describe a discrete-approximation to a van der Pol oscillator with nonlinearity parameter, mu, equal to 1. The functions assume additive process and measurement noise in the system. Specify the initial state values for the two states as [1;0]. This is the guess for the state value at initial time k, using knowledge of system outputs until time k-1, xˆ[k|k-1]. Load the measured output data, y, from the oscillator. In this example, use simulated static data for illustration. The data is stored in the vdp_data.mat file. Specify the process noise and measurement noise covariances of the oscillator. Implement the extended Kalman filter algorithm to estimate the states of the oscillator by using the correct and predict commands. You first correct xˆ[k|k-1] using measurements at time k to get xˆ[k|k]. Then, you predict the state value at next time step, xˆ[k+1|k], using xˆ[k|k], the state estimate at time step k that is estimated using measurements until time k.
To simulate real-time data measurements, use the measured data one time step at a time. When you use the correct command, obj.State and obj.StateCovariance are updated with the corrected state and state estimation error covariance values for time step k, CorrectedState and CorrectedStateCovariance. When you use the predict command, obj.State and obj.StateCovariance are updated with the predicted values for time step k+1, PredictedState and PredictedStateCovariance. In this example, you used correct before predict because the initial state value was xˆ[k|k-1], a guess for the state value at initial time k using system outputs until time k-1. If your initial state value is xˆ[k-1|k-1], the value at previous time k-1 using measurement until k-1, then use the predict command first. For more information about the order of using predict and correct, see Using predict and correct Commands. extendedKalmanFilter — Uses the extended Kalman filter algorithm. unscentedKalmanFilter — Uses the unscented Kalman filter algorithm. particleFilter — Uses the particle filter algorithm. Measured system output at the current time step, specified as an N-element vector, where N is the number of measurements. Additional input arguments to the measurement function of the system, specified as input arguments of any type. The measurement function, h, is specified in the MeasurementFcn or MeasurementLikelihoodFcn property of obj. If the function requires input arguments in addition to the state and measurement noise values, you specify these inputs in the correct command syntax. correct command passes these inputs to the measurement or the measurement likelihood function to calculate estimated outputs. You can specify multiple arguments. Corrected state estimate, returned as a vector of size M, where M is the number of states of the system. If you specify the initial states of obj as a column vector then M is returned as a column vector, otherwise M is returned as a row vector. For information about how to specify the initial states of the object, see the extendedKalmanFilter, unscentedKalmanFilter and particleFilter reference pages. Corrected state estimation error covariance, returned as an M-by-M matrix, where M is the number of states of the system. After you have created an extended or unscented Kalman filter, or particle filter object, obj, to implement the estimation algorithms, use the correct and predict commands together. At time step k, correct command returns the corrected value of states and state estimation error covariance using measured system outputs y[k] at the same time step. If your measurement function has additional input arguments Um, you specify these as inputs to the correct command. The command passes these values to the measurement function. The correct command updates the State and StateCovariance properties of the object with the estimated values, CorrectedState and CorrectedCovariance. The predict command returns the prediction of state and state estimation error covariance at the next time step. If your state transition function has additional input arguments Us, you specify these as inputs to the predict command. The command passes these values to the state transition function. The predict command updates the State and StateCovariance properties of the object with the predicted values, PredictedState and PredictedCovariance. If the current output measurement exists at a given time step, you can use correct and predict. If the measurement is missing, you can only use predict. 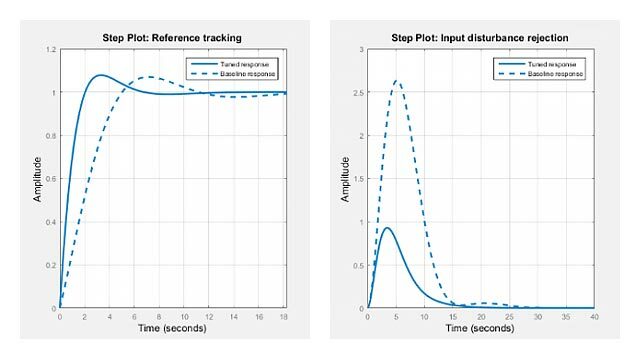 For details about how these commands implement the algorithms, see Extended and Unscented Kalman Filter Algorithms for Online State Estimation. correct then predict — Assume that at time step k, the value of obj.State is x^[k|k−1]. This value is the state of the system at time k, estimated using measured outputs until time k-1. You also have the measured output y[k] and inputs Us[k] and Um[k] at the same time step. Then you first execute the correct command with measured system data y[k] and additional inputs Um[k]. The command updates the value of obj.State to be x^[k|k], the state estimate for time k, estimated using measured outputs up to time k. When you then execute the predict command with input Us[k], obj.State now stores x^[k+1|k]. The algorithm uses this state value as an input to the correct command in the next time step. predict then correct — Assume that at time step k, the value of obj.State is x^[k−1|k−1]. You also have the measured output y[k] and input Um[k] at the same time step but you have Us[k-1] from the previous time step. Then you first execute the predict command with input Us[k-1]. The command updates the value of obj.State to x^[k|k−1]. When you then execute the correct command with input arguments y[k] and Um[k], obj.State is updated with x^[k|k]. The algorithm uses this state value as an input to the predict command in the next time step. Thus, while in both cases the state estimate for time k, x^[k|k] is the same, if at time k you do not have access to the current state transition function inputs Us[k], and instead have Us[k-1], then use predict first and then correct. For an example of estimating states using the predict and correct commands, see Estimate States Online Using Extended Kalman Filter or Estimate States Online using Particle Filter.